Note: This post is not about atheism or religion. It’s not even about skepticism in general. It’s about me. But I’m sure other skeptics out there feel the same way I do. I’m not a huge fan of the science fiction genre, per se, but I do enjoy several series and movies that fall under that classification. For example, I very much enjoyed BSG (both incarnations), and I watched The 4400 almost religiously and felt betrayed when it was cancelled during a cliffhanger. But generally I have a difficult time watching science fiction films and television series because I have a natural tendency to suspend my suspension of disbelief. And this, at times, annoys the hell out of me. This can make watching a 22 minute episode on Netflix very tedious — as I pause the player every 45 seconds to either check a claim or, even worse, type a query into EBSCOhost to read about what the latest scientific literature says about a topic discussed in the episode. I’ve — quite a few times — turned a single episode of something like Jericho into a five hour review-of-the-literature on nuclear weapons. (By the way, it’s my professional opinion that Jericho accurately depicts what would happen if the United States suffered several nuclear detonations). Sometimes, of course, a movie or episode makes a claim or sets a stage that piques my curiosity, but I’m unable to find what the scientific literature says about that topic. This can make my head explode. So what do I do in this circumstance? I mean, my suspension of disbelief is still suspended, so I have to do something. I write to my friends in academia or professional research who study those particular fields and ask for their input. 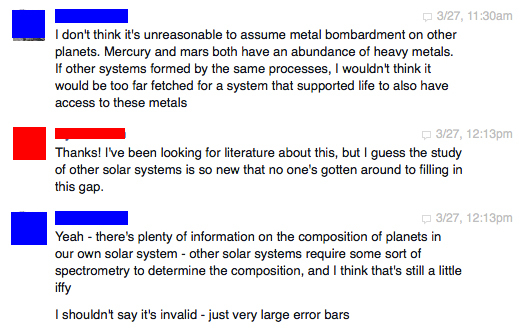 Here’s a discussion I had earlier this year with a friend of mine who is a physicist working at LASP. Of course, my friend gave the classic non-answer we expect from people with intellectual integrity. His answer is basically this: We have no reason to reject X, but we don’t yet have the capability to support X. In other words, “I don’t know, but I’m leaning towards yes.” This non-answer, while honest and all I could expect from someone who actually studies this, does absolutely nothing to satisfy my intellectual curiosity. And thus, I’m left thinking about this question throughout the remainder of the movie or series. I’m able to somewhat still enjoy it, but I can’t shake that skepticism. So am I alone? Do others out there suffer through the same intellectual curiosity that I suffer? So much that it prevents you from fully enjoying science fiction, documentaries, or other mediums of entertainment? Interestingly, I don’t have this problem when watching fantasy. I can easily suspend my disbelief when I know what I’m watching is impossible (probably because “impossibility” is a satisfying answer). This entry was posted in Atheism and tagged Atheism, Science, science fiction, science fiction films, skepticism, suspension of disbelief. Bookmark the permalink. I enjoy reading and watching science fiction series (most notably “Star Trek” and “Star Wars”). Watching these series, I’d constantly think of how silly it is to have all these humanoid aliens speaking English and having human concerns. It got really bad when I wrote my own science fiction novel. Eventually I had to remember that it’s still fiction. All of it is conjecture, made up, and fantasy to an extent. While I tried to write my story as plausibly as I could, I had to remember that it’s still a shot in the dark. What was more important were how the characters reacted to things. And that’s true for any story. The story needs to be captivating for me to suspend disbelief and I have found more sci-fi than fantasy that works for me. I’ll call it “poetic license” when I like the story and will forgive almost anything. You are not the only one out there by any means. I tend to sometimes irritate family members by my mild outbursts of “No, it just doesn’t WORK LIKE THAT!” during a movie.